Where can I find the best dive spots in Malaysia? Malaysia has numerous great dive locations. 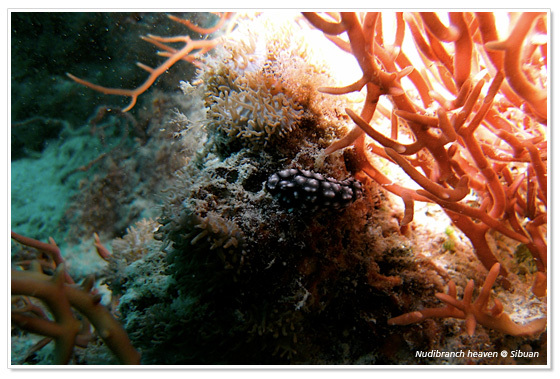 The best dive sites in Malaysia can be found in the southeastern region of Sabah (on the island of Borneo). Easiest to reach are the dive sites at the east coast of Peninsular Malaysia, but this region is prone to the yearly monsoon season between October and March. Below our top10, based on the dive conditions, bio-diversity and attractiveness. These three islands probably contain the best dive sites in the whole of Malaysia. Sipadan is by far the best place to enjoy scuba diving; it is also not that easy to actually dive at because of the restricting rules that are in place (daily permit). Mabul is known worldwide for its amazing muck diving conditions. Kapalai is a small sand bank, not that great for diving, but here you can find a very exclusive resort built on stilts. Actually both Sipadan and Mabul earn their own spot in this list, but since you can’t visit one (Sipadan) without the other (Mabul) we just listed the whole cluster as one entry. A small island located north of the city of Sandakan in eastern Sabah. Lankayan only has one (luxurious) resort and it’s all about diving and relaxing. Accommodation might be quite expensive for non-divers, they might be better off at numerous other islands. After Sipadan, Lankayan probably offers the best dive spots and diving conditions in Malaysia. Layang-Layang is not a tropical island per se. It is a concrete landing strip with one resort and a marine base, located on a big sand bank located just below sea level. 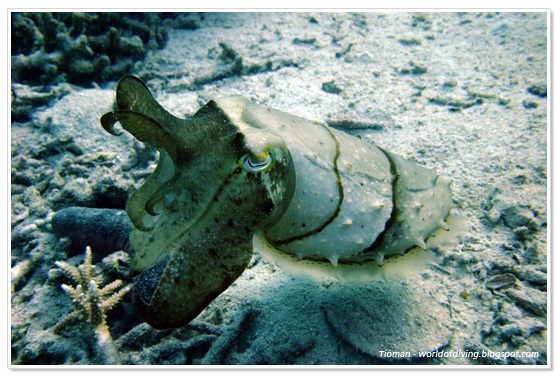 Layang-Layang is located in a remote area, where the underwater world has not been affected by human beings. Corals are in pristine conditions. Layang-Layang is a place to see big species and big schools of fish (not so much smaller stuff). Though not as great as diving conditions at the nearby islands of Sipadan and Mabul, the area surrounding Mataking, Pom and Sibuan still offers quite a few amazing dive sites (especially Sibuan is known for great muck diving). Mataking is a wonderful place to stay. There is a very luxurious resort from where you can enjoy dive trips in the area. Redang is the first island in our list that is not located in Borneo. Redang Island lies within the Terengganu Marine Park, nearby the city of Kuala Terengganu at the east coast of Peninsular Malaysia. Redang offers great dive sites and perfect dive conditions. It is a great place to start with your diving adventure, as prices of a 4 day PADI course are very affordable. Redang cannot be visited between October and March because of the monsoon season. Located between the more popular islands of Redang and Perhentian, the smaller island of Lang Tengah offers great diving opportunities. The island has a few nice resorts, and is also suitable for non-divers. Lang Tenggah cannot be visited between October and March because of the monsoon season. Tenggol Island is located at the east coast of Peninsular Malaysia. It offers splendid diving conditions, but it is perhaps not suitable for beginners due to the currents that often play a big role in dives around the island. There are a few nice resorts on the island. Tenggol cannot be visited between October and March because of the monsoon season. Diving conditions at Tioman are similar to the other popular islands at the east coast of Peninsular Malaysia. Especially great about Tioman is that besides diving it is also a great place to do snorkeling, sunbathing and kayaking. The island is big enough to do numerous other fun activities. Possible downside might be that is not that easy to reach compared to other islands (unless you are willing to pay dearly for the direct KL -> Tioman flight operated by Berjaya Air). Perhentian is the best island in Malaysia to do a diving course. The diving conditions are splendid for beginners, and there are many dive spots available to enjoy immediately after finishing the PADI course. Perhentian has calm waters and an abundance of marine life. Besides diving it is probably one of the best islands for snorkeling, with shallow reefs with pretty nice corals and great marine life (also big fish and many turtles). 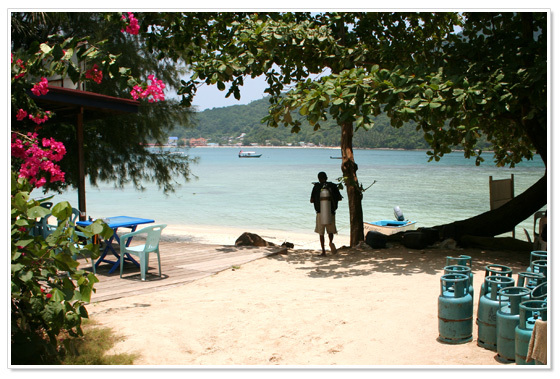 At Perhentian prices for fun dives and for the diving course are probably the lowest in Malaysia. If you are a beginner, Perhentian Island is definitely the place to be! Right opposite of the city of Kota Kinabalu in western Sabah (Borneo) lies the wonderful Tunku Abdul Rahman Marine Park (TAR Marine Park). This area contains numerous dive sites that are definitely worth a visit. Dive schools mainly operate from out of Kota Kinabalu, though there are also a few that are located on the islands. Similar to Perhentian Island this is a great place to start diving by doing a 4 day PADI course as the dive conditions are optimal for beginners. 11. Mantanani Island; a little bit better than TAR Marine Park but also a bit more remote located. 12. Kapas Island; great option, small island, easy to reach from Kuala Terengganu. Many (better) dive sites at nearby islands though. 13. Talang-Talang Island; small island nearby Kuching. Not really a renowned dive spot, but might become one in the future. 14. Tiga Island; popular island nearby Kota Kinabalu. Better dive sites at the east coast of Sabah, but still some very nice sites. 15. Mengalum Island; if you are only staying around Kota Kinabalu. 16. Pulau Payar; your best option if you are only visiting the west coast of Peninsular Malaysia. 17. Selingan Island (Turtle Island near Sandakan); not really a perfect dive spot, but the best place to visit to learn more about turtles. 18. Satang Island (Turtle Island near Kuching); another turtle island in Malaysia. Read about Malaysia Scuba Diving at Sipadan Island and more at Dive-the-world.com. Are there any beaches nearby Kuala Lumpur? I live in Kuching and I can tell you for sure that Satang Island is NOWHERE near any of the top 10. What you will see are silted up almost completely dead reefs, poor visibility and lots of sea urchins. Maybe a turtle or squid or two if you’re VERY lucky. Maybe a few clownfishes nesting in half dead anemones but give Satang a miss. It’s already dead and is constantly visited by the locals who have nowhere better to go within that range. Hello,I’m Samaneh . I’m a dive master (PADI). I’d like to work as dive master . Please assist me. Matakang Island is my favorite. It’s underrated but if you explore its depths, you’ll see what you’ve been missing all your life if you haven’t dove in the area yet. Its pristine and enchanting beauty will leave you breathless. Amazing locations. Love Redang Island. Best place to go. Beatiful locations, I like all of them. Please visit Aur Island of Johor for another snorkeling and diving experience. Please suggest a holiday for a family of 5. We all dive very well and love liveaboards but want to see the mainland sites and jungle too, and of course wildlife. Hiking is a favourite pastime. We can come during March/April and June/July, 2016. Have a look at http://www.ScubaDutch.com. I might be able to help you out as being a local dive instructor and owner of ScubaDutch. Ps. I would go in March/April, diving in considered better early in the dive season. You can visit seamonkeydiver.com or enquire us at [email protected]. We have many dive trips that you can choose from. As for LOB we have one in the west coast with Project Aware that we are arranging now. I am planning to take an open water diving course in November. Which is the best island to go? Maybe top 3? Padi OW is best to do at a good place for beginners. Perhentian is that plus the island itself is very laidback…. Wait. November. No can do. Rainy season along the east coast. So, yes, you are better off somewhere around Borneo :). Hmm. Still I would probably not recommend Sipadan/Mabul per se. Maybe check into Mantanani near Kota Kinabalu? Hey Ilya, thanks for your response. Yes, totally agree that I should only go to Sipadan/Mabul when I am more experience to get the most out of them. I meant what are the top 3 places to go for a OW course in Nov (considering the Monsoon season)? 5. Very easy to travel to, with daily flights and many hotels to choose from. Is there a map with those places? How far are they from KL? The names by themselves don’t mean anything to me? I think Google Maps is your best friend here…. Is May the month to go for scuba diving in Mohul/sipadan island? is mid February too early? Where would you recommend as good diving for him and beautiful beach for me?